I am working on a large Holmes County Amish post for later this week. 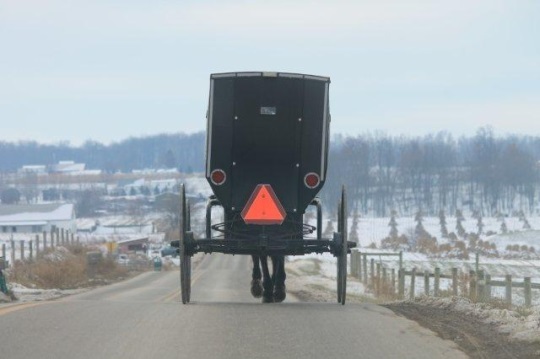 In the meantime a few preview photos and some recent news stories featuring Amish. Holmes County as you probably know is the largest Amish community in Ohio, and along with Lancaster one of the two largest in America. It’s interesting but not surprising that the Geauga County community (pronounced closer to “JAW-GA” than it is to “GEE-AH-OO-GAH”) to the north is not nearly as well-known as Holmes County, though it is now over 100 church districts in size. The Geauga settlement came about around 80 years after Holmes was founded, when Amish from Holmes County moved into the area. The land was apparently considered poor for farming at the time. 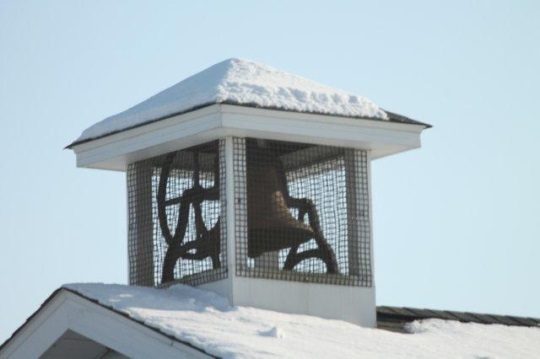 A few winter photos from Holmes County, courtesy of a reader who recently visited, with more to come soon. We’ve looked at the practice of Amish holding benefit breakfasts before, including in this post on an Amish benefit breakfast in New York. A recent story in the Wisconsin Rapids Daily Tribune reports from a benefit breakfast in Milladore, Wisconsin. It was started to “help fund education”, but now proceeds go to medical costs. How much does a benefit breakfast earn? “Each year, there’s about $600 profit,” said Joe Mast, who is Amish and has organized the Amish Benefit Breakfasts since they started about three years ago. Members of the Amish community only seek professional medical care when they aren’t comfortable treating an injury or illness themselves, Mast said. “We started the breakfasts to help with school costs, but the costs of hospital stays have increased,” Mast said. Given the price of hospital treatment, $600 doesn’t seem like much, but I suppose every bit counts. Saloma Miller Furlong, author of Why I Left the Amish and the forthcoming Bonnet Strings: An Amish Woman’s Ties to Two Worlds, discusses her experience in an article for Mennonite World Review (no longer online). Saloma grew up Amish in Geauga County and left the community as a young woman. In another story, a father whose daughter was killed in a December school shooting in Denver recently offered the shooter his forgiveness. Great photos.. As to the pronunciation of Geauga.. Maybe the Amish pronounce it the way you shared, but the English including news castors in this area pronounce it “Gee Aug uh”. 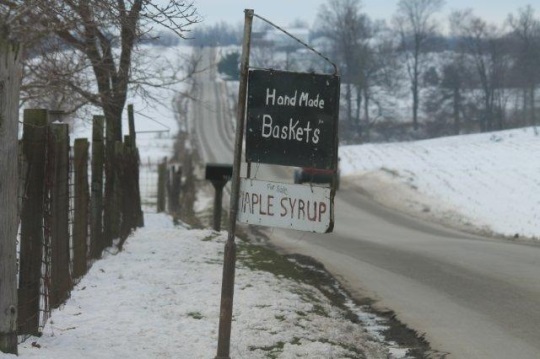 We live 30 miles from Middlefield and Geauga County is one of my favorite places to visit.. I also belong to a CSA (Community supported agriculture) group from Geauga & Trumbull counties that are predominately Amish.. Not sure if I’ve shared my photos of one of their homes/gardens in the past but here is a link to a blog I wrote about it last year.. Beautiful place.. great folks! Thanks Kim, I guess I was trying to be funny there with my alternate pronunciation. I think I’ve heard the 3rd syllable of which you speak 🙂 For me when I’ve heard it it sounds more like the first 2 are sort of combined (“Geeau”) and more like 1.5 syllables. Anyway I love anything to do with pronunciation and local speech. When I first got acquainted with northern Lancaster County, I pronounced the large town there as Eff-FRATT-a 🙂 Incorrect! Beautiful photos in that CSA post, thanks for sharing it. Makes me miss fresh veggies and green scenes. Can you give me some direction to finding Michigan Amish and info or links on Amish penpals? also said that some people pronounce it “Jaw-ga” like you mentioned above. Your comments about benefit breakfasts also brought back memories. breakfast haystacks were served. There was no set charge for this breakfast, but they had a big box at the beginning of the line where everyone put a “freewill donation”. Thanks also for sharing about the Nickel Mines/Newtown families gathering. Very interesting. Hi, my name is garrett and I was happy to see someone mention Middlebury, that is where I’m moving to soon. Glad you enjoyed it Al. The Holmes post should be up tomorrow. And I’ll take a haystack any day of the week. On the Newtown/Nickel Mines, it’s disturbing that school shootings are a regular enough occurrence that you can even miss them. I don’t know if I ever even caught news of that Denver shooting when it happened. I don’t follow the news like I once did, but still. Very nice letter. I love the benefit meals also. The first one I ever when to was so memorable. I had to walk to my car because I had tears in my eyes. I couldn’t believe that only 13 miles from my house peoole lived such a pure life. I’m now friends with 63 families and bought each family a fire extinguisher after a terrible fire that killed two children. A little Amish boy came up to me and said ” ich liebe dich” They are in my will. Each week I buy 3 lotto tickets which if a winner the funds would all go to three different communities. Iowa is also known as “I-away”. I might have said “Aunt Matilda got married and moved to I-away.” That too helps to make Holmes the unique place it is. Pony cart baseball-newest Amish sport?